The Sanatan Dharma Mandir of Florida is a place of worship to God. Devotees are encouraged to come to the mandir and perform Puja to their Isht Devtas. The worship of God helps the devotee attains God’s Realization. The revered Pandit Baljit Ramnarain is the presiding priest at the mandir. 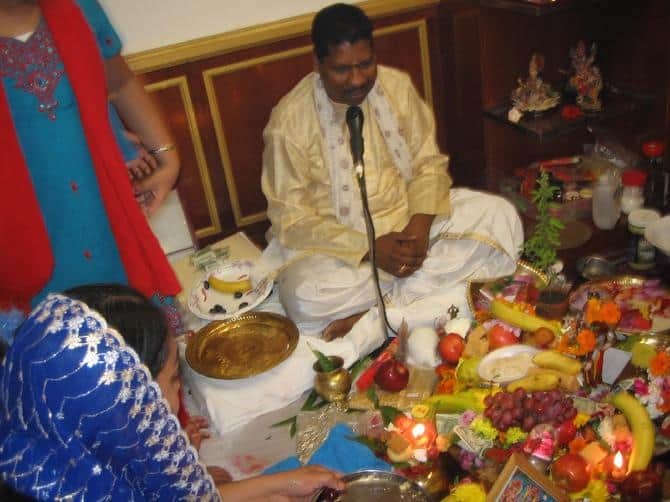 Panditji has been serving the Hindu community in Guyana, New York and further afield for over 50 years. Panditji works selflessly and tireless to promote Sanatan Dharma. His outstanding community work is known near and far. His honesty, simplicity, dedication, sincerity and unconditional love for Sanatan Dharma are his trademarks. Panditji is one of our unsung heroes. He worked very hard to make something of his life, but more so for the benefit of the community and to enhance the quality of life for people in the community. Being born in a Brahman home, he experienced an innate calling to serve his people in a religious capacity. At an early age, he started studying the Hindi and Sanskrit languages. He took to studying the Hindu religious texts, such as the Holy Ramayan, the Sacred Bhagavad Gita and the many other scriptural texts. His early preparation and perseverance paid off handsomely. Today, Panditji is one of our most learnt, inspiring and respected spiritual leaders. While the mandir is being built, Pandit Ramnarain has generously donated his home as the mandir for devotees to come and perform Puja to God. Panditji conducts Puja, the sacred Havan Ceremonies and all other major Parbs at his home freely for devotees to worship God. Recently, he celebrated the Shiv Ratri Vrata Puja for the entire night at the mandir home. Devotees attended in such large numbers that there is absolutely no doubt that the Hindu community there needs a larger mandir to worship.